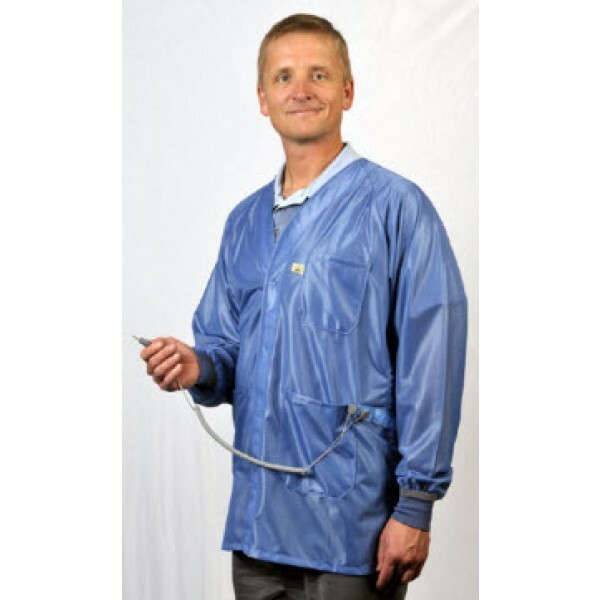 Tech Wear Hallmark ESD-Safe Dual Monitor 34"L Jacket With Cuff OFX-100 Color: Hi-Tech Blue Size: 5X-Large. Hallmark garments feature raglan sleeves, reinforced hem V-neck and are groundable with ESD-grid-knit cuffs and stainless steel snaps at the wearer's waist to snap a ground cord. Notes: Ground-monitorable when connected to monitor with dual ground cord (sold separately). The ESD grid-knit cuff (left cuff is connected to isolated path leading to the monitor snap on the wearer's left hip). Tech Wear Hallmark ESD-Safe Dual Monitor 30"L Jacket With Cuff OFX-100 Color: Hi-Tech Blue Size: X-Small. Tech Wear Hallmark ESD-Safe Dual Monitor 32"L Jacket With Cuff OFX-100 Color: Hi-Tech Blue Size: X-Large. Tech Wear Hallmark ESD-Safe Dual Monitor 32"L Jacket With Cuff OFX-100 Color: Hi-Tech Blue Size: Medium. 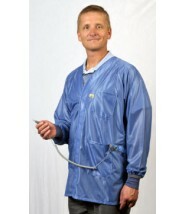 Tech Wear Hallmark ESD-Safe Dual Monitor 33"L Jacket With Cuff OFX-100 Color: Hi-Tech Blue Size: 3X-Large. Tech Wear Hallmark ESD-Safe Dual Monitor 33"L Jacket With Cuff OFX-100 Color: Hi-Tech Blue Size: 4X-Large. Tech Wear Hallmark ESD-Safe Dual Monitor 33"L Jacket With Cuff OFX-100 Color: Hi-Tech Blue Size: 2X-Large.